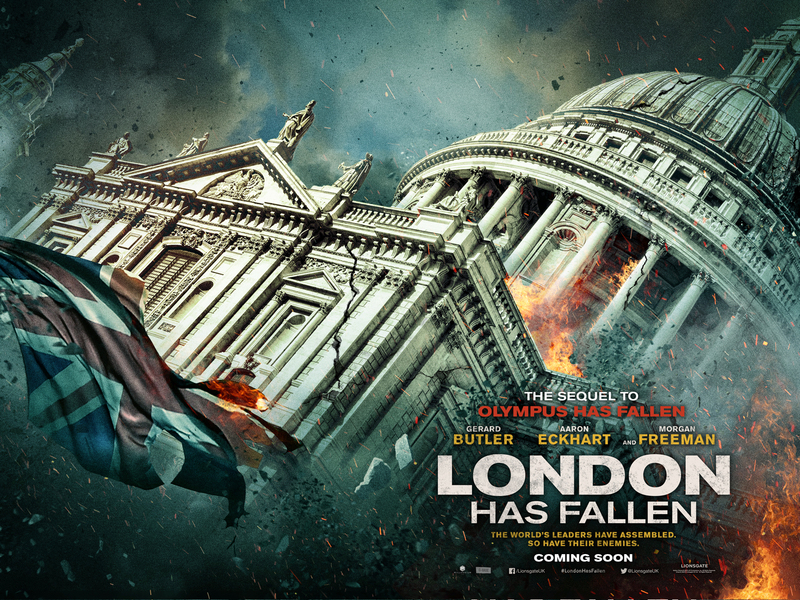 Lionsgate UK has today released the first trailer for London Has Fallen, the sequel to 2013’s Olympus Has Fallen. I can only assume that the release of the trailer had been scheduled around the original October 2015 release date, before it was pushed back to January 2016*. Not that I’m complaining, It’s been a loooong time since I’ve seen Gerard Butler on the big screen (and no, animated voice acting does not count). Whether that is a good thing or a bad thing depends on your perspective. To quote Peter Quill, I’d say it’s a “bit’a both”. Following the events of the original film, in which Mike Banning (Butler) single-handedly saved the President (Aaron Eckhart) from the clutches of a North Korean terrorist bent on our complete annihilation, Banning has been reinstated as not only a member of the Secret Service, but he’s back on his friend and President’s personal detail. In the sequel, the two, travel to London to attend the funeral of the British Prime Minister. Terrorists come of the woodwork, seeking to capitalize on this confluence of world leaders. This is only the first little teaser, but it would appear that President Asher doesn’t have to play the damsel in distress in this one, and gets to assist Banning with the world-saving. 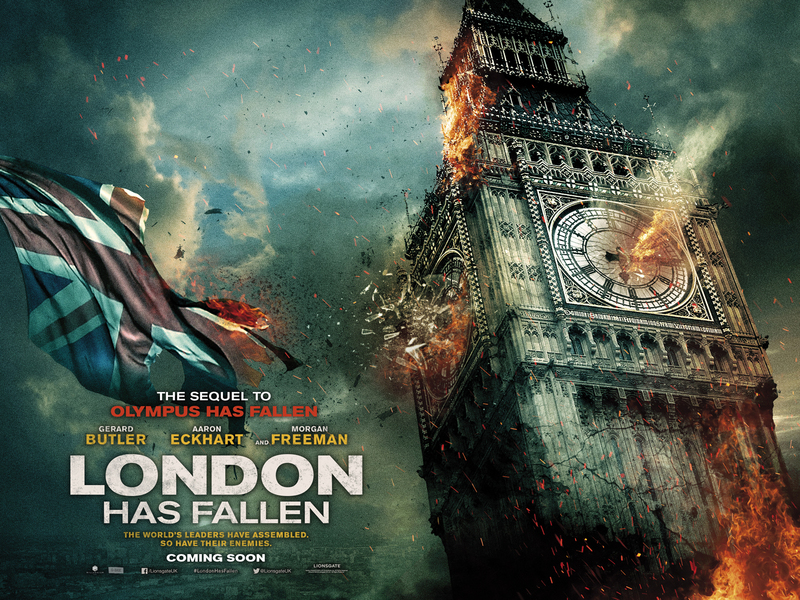 Call me crazy, but I like the on-the-nose use of “London Bridge is Falling Down” underneath it. Radha Mitchell is back as Banning’s wife Leah. Maybe he’ll take her along for that long-delayed honeymoon. (A little snogging would be nice, Butler. Throw your distaff fans a bone.) My guess is that the other returning players, including Head of the Secret Service, Lynn Jacobs (Angela Bassett), Speaker of the House Trumbull (Morgan Freeman), Secretary of Defense McMillan (Melisso Leo)NSA Deputy Director Ray Monroe (Sean O’Bryan) and even blowhard General Clegg (Robert Forster) are probably all left at home manning the switches. Directed by Babak Najafi ( Easy Money II: Hard to Kill, “Banshee”), written by Katrin Benedikt and Creighton Rothenberger (who penned the original) and Christian Gudegast (A Man Apart, Den of Thieves**) with Chad St. John, the sequel also stars Charlotte Riley, Colin Salmon, Patrick Kennedy, Shivani Ghai, Mehdi Dehbi and Andrew Pleavin*** and will be released on January 22, 2016. *I know, I know. The rule is “beware the films of January” – but I’ve also said January is not the wasteland it used to be. I’m holding onto a kernel of hope. It’s Gerard Butler after all. I’m nothing if not loyal. I’m more perturbed by the fact that this film’s date was usurped by the Point Break remake. **Den of Thieves is in pre-production and also stars Gerard Butler. I have to wonder whether or not it’s in jeopardy, like the oft-rescheduled Hunter Killer, due to Relativity’s financial woes.